Ten days ago, web documentary “Helicoca – The 60 Million Reais Helicopter” was removed from YouTube thanks to a copyright claim by a person named “Jorge Scalvini”. 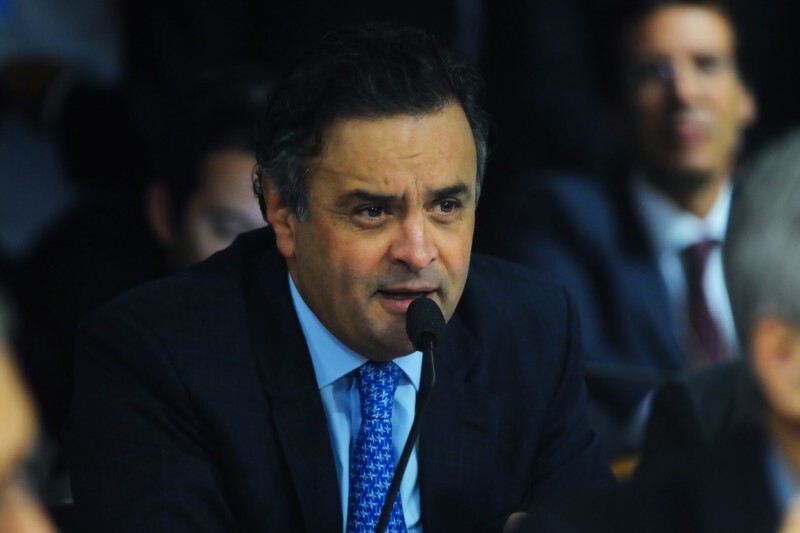 Local netizens have begun to suspect that the video's removal was set in motion by presidential candidate Aécio Neves. The documentary investigates one of the largest drug seizures by police in Brazil’s history, in which half a ton of cocaine was found in a helicopter belonging to the powerful Perrella family. The Perellas are key political allies of Aécio Neves, the Brazilian Social-Democratic Party (PSDB) presidential candidate and former governor of Minas Gerais, which borders both São Paulo and Rio de Janeiro. The pilot and staff who helped maintain the helicopter were charged with the crime, while police rapidly dismissed the possibility of any involvement by the Perrella family. The strange absence of information about the Perrellas’ role in the incident motivated local journalists to further investigate the story. Developed and commissioned via crowdfunding by Diário do Centro do Mundo, an independent, left-leaning news site, the documentary was directed by Joaquim de Carvalho, a seasoned journalist who has worked for major Brazilian news outlets such as O Estado de S. Paulo and TV Globo. We tried to find out who Scalvini is. His email is zerobeta000@gmail.com. We sent him a message to this address and received no reply. It seems to be a fake profile after all. Scalvini has a Twitter account, opened in 2012, with no tweets. His profile on Facebook is empty, with a few likes on pages like “TV Revolta”, “Mensaleiros na TV” e “Chega de Corrupção”. He has also an account on YouTube with his name. He last logged in three months ago. In order to avoid copyright infringement suits, the general practice at Google (owner of YouTube) is to remove such videos. It is incumbent on the video's creator, and not the complainant, to prove that he or she has the right to present the video. Diário do Centro do Mundo has appealed the case with Google and has been told to expect an official reply within 10 days’ time. The video, as you can see, was taken down. Some George Scalvini guy claimed intellectual ownership of the video. It's needless to comment on the similarity between the two names. Apparently, Aécio's campaign has a team specialized on not only taking down videos with accusations that could harm his candidacy, but also little jokes like this, that among all the examples of activist humor is one the most good-natured and inoffensive. Although the documentary contains some footage of Neves taken by TV news stations, and thus potentially vulnerable to copyright violation claims, the spoof video includes no content of this sort. What concerns netizens following the story is that both videos had their property rights challenged by the same person — who may not be a real person at all. The only discernible connection between the two videos is the mentioning of Aécio Neves..
Suspicions have also been fueled by Neves’ various past attempts to quiet criticism of his leadership on social media. In late August, Neves filed a lawsuit against Twitter after the company refused to disclose information and IP addresses for 66 Twitter users. The former governor claimed the accounts were all fake profiles orchestrated by a specific group to disseminate lies and criticism about him and his campaign. Official documentation of the suit can be seen here. I think this is great, now he must prove [the paid network of defamers] actually exists. I have been a political activist since I was 18 years old. My mother fought against the dictatorship, my aunt went to jail and was tortured. And he insinuates I am paid to be an activist. In the previous week, senior executives [of Current TV] in the US received letters with harsh considerations and serious criticism of the movie. Letters were sent by PSDB of Minas Gerais. PSDB said my film was of a “political-partisan” nature and didn't represent the reality in the state, besides questioning the ethics of my conduct during the production of the film. According to Florêncio, during an internal investigation at Current TV he had to prove to his journalism director Andrew Fitzgerald every statement he used in the movie and that the accusations made by PSDB were false. A month later, Fitzgerald agreed to put the documentary back on the air. Meanwhile, PSDB Youth has created a counter-video, also narrated in English, rebuffing the accusations featured in “Gagged in Brazil”. In sum, these incidents have left bloggers concerned that the recent video removals are more than just coincidence. And Neves’ past behaviors suggest there may be more to come.